Please take the following pledge, and announce on your website and social media that you’re joining the cause to #SaveOurBooks. 1) I will appear in public carrying a book. 2) I will go to a library or store and get a book for myself, a friend, or family member. 3) I will publicly go on record (in governmental session, at a public event, or on social media) saying that I am concerned about the state of reading. The campaign is accompanied by this inflammatory video. Am I alone in thinking that overstating your case by so much ends up being counterproductive? Nobody really thinks do they that the end of the book is nigh? Some do worry that that might be true of the printed book; though not me. But I don’t think most observers now think that e-books are going to take over the entire market (— and then suddenly disappear as the campaign appears to be implying)! I fear many viewers of the video will think (like I did sneakingly) that chucking things onto that bonfire looked like a lot of fun, and was maybe something we should all try out! We can agree that encouraging reading is a good thing, but otherwise the aims of the campaign seem rather modest. Having the President go around with a book under his arm and be seen visiting a library once a month are not bad things, but practicalities are both more pressing, and pointing in a different direction. Do we as a society think that physical books should be protected, and that the bookstores which traditionally have provided the interface between publisher and customer should be preserved in their traditional form? France recently restricted Amazon’s discounts in a move to protect French bookstores. In Britain we used to have the Net Book Agreement whose purpose was similar. 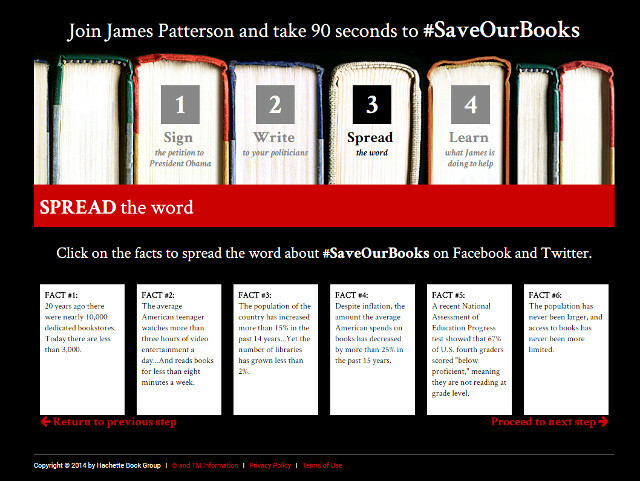 Is James Patterson going to push for some such legislation? Even if he could persuade a Democratic President that protecting bookstores was a good idea, he certainly couldn’t talk a Republican Congress into interfering with the freedom of the marketplace to such an extent. Market forces are not going to go away because Congress wishes it anyway. The fact is that books just don’t yield enough income for the bookseller to be able to afford to pay down-town rents. As a result people are less and less able to find a bookshop, so that even if they wanted to resist the pull of Amazon’s discounting and efficiency, they feel they cannot. Nothing ever ends up totally black or totally white of course: in the end an equilibrium will be found, which if we are lucky will include a heathy number of prosperous (or at least not failing) independent bookstores. This is the way things look today in New York City at least, where we see new and interesting independent bookstores opening away from the business districts, and a flight of chain bookstores. Mr Patterson’s heart is in the right place, but as his campaign progresses I hope the focus narrows. Is promoting reading really the central aim? If so “Save our books” seems like the wrong flag to be waving. Do we really want to save bookstores? Then is tangling that up with encouraging reading really the best way to go?